We can go through some truly horrible times with this terrible disease. So it is truly wonderful when we can see news like this. I am so very happy for Emily and her husband. I encourage anyone out there who is newly diagnosed or those of reproductive age dispite treatment to ask your health care team about what your options are for fertility preservation/treatments. Often reproductive health is overlooked when cancer seems so much more important, but it is a very important area of life that we may not want to close the door on. Congratulations EmBen, wishing you all happiness and health. I am honored to share with you our Cancer Today cover story! 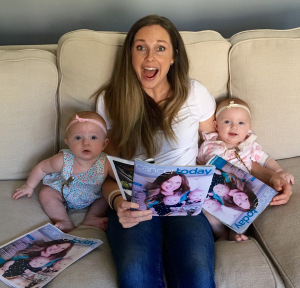 Over a year ago, Senior Editor Marci Landsmann read my surrogacy blog post, and contacted me about telling our story. She wanted to focus on our quest for fertility throughout our cancer journey, and after a few interviews, said she’d be in touch for an update once our future children were born. Shortly after Maggie and Hope arrived, Marci reached out again, and talking with her was like catching up with an old friend. I am extremely grateful for the candid, beautiful, poignant way she told our story. I’ll admit she made me cry…several times. This story will forever be cherished by our entire family, but it will also provide courage and hope to cancer patients as they struggle to realize dreams of their own families. Thank you, Marci. Hey girls, look what came in the mail today!